Byron W. Brooks, A.I.C.P., County Administrator: Previous work: For the past 13 years, he has served as Chief Administrative Officer with the City of Orlando, where he oversees all operating departments in the organization of 3,600 employees as well as an operating budget of $1.3 billion. He has more than 32 years of experience in the public sector. 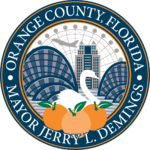 Other positions of note: Orange County Deputy County Administrator, serving Orange County Government for 14 years; Executive Director of LYNX; Education: M.A., Clemson University; B.A., Furman University.